More pastry practice! 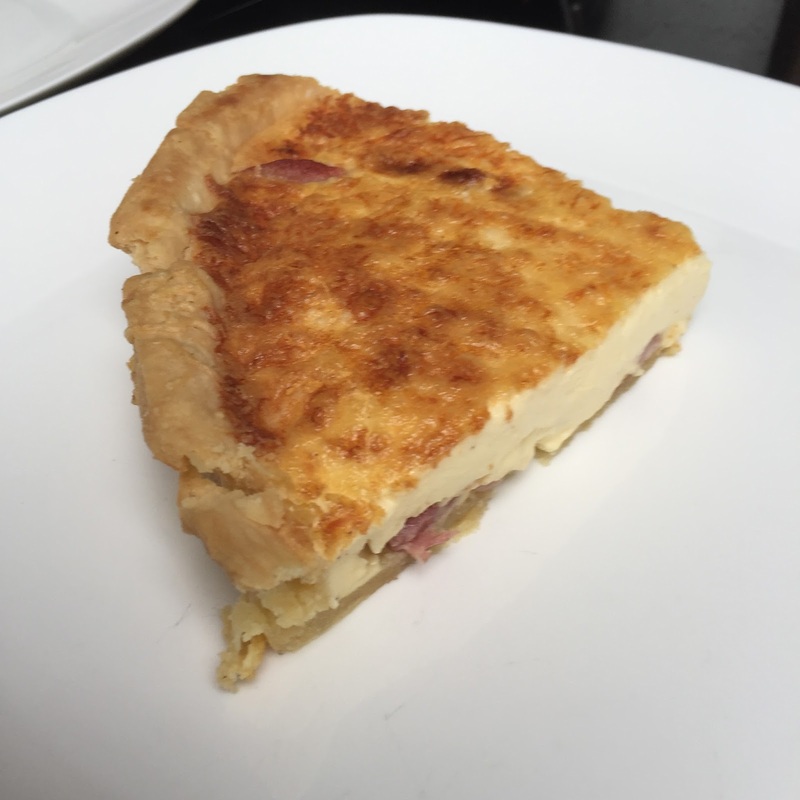 This time a savoury recipe, and who doesn't like a good quiche lorraine? 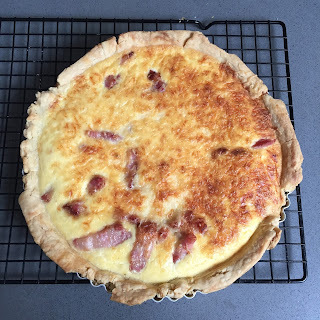 This recipe is from BBC Good Food again (love the magazine) and is really rich and creamy. For the pastry, put the flour, butter, egg yolk and 4 tsp cold water into a food processor. Using the pulse button process until the mix binds (alternatively mix with stand mixer or rub the butter into the flour with your hands and stir in the egg yolk). Tip the pastry onto a lightly floured surface, gather into a smooth ball then roll out as thinly as you can (controversially don't rest the pastry!) Line a 23 x 2.5cm loose bottomed fluted flan tin, easing the pastry into the base. Trim the pastry edges with scissors (save the trimmings) so it sits slightly above the tin (if it shrinks it shouldn't now go below the level on the tin). Press the pastry into the flutes, lightly prick the base with a fork (called docking) and chill for 10mins. Put a baking sheet in the oven and heat to 200c/180c fan/gas 6. Line the pastry case with foil, shiny side down, fill with dry beans and bake on the hot sheet for 15mins. Remove foil and beans and bake for 4-5mins more until the pastry is pale and golden. If you notice any small holes or cracks patch up with pastry trimmings. You can make up to this point a day ahead. Whilst the pastry cooks prepare the filling. Heat a small frying pan, tip in the lardons and fry for a couple of mins, Drain off any liquid that comes out, then continue cooking until the lardons just start to colour, but arn't crisp. Remove and drain on paper towels. Cut three quarters of the cheese into small cubes and finely grate the rest. Scatter the diced cheese and fried lardons over the bottom of the pastry case. Using a spoon beat the creme fraiche to slacken it, then slowly beat in the double cream. Mix in the beaten eggs. Season (you wont need much salt due to the lardons) and add the nutmeg. Pour three quarters of the filling into the pastry case. Half pull the oven shelf out and put the flan tin on the baking sheet. Quickly pour the rest of the filling into the pastry case-you get it right to the top this way. Scatter the grated cheese over the top, then carefully push the shelf back into the oven (having someone else to help really makes this easier!). Lower the oven temp to 190c/170c fan/gas 5. Bake for about 25mins or until golden and softly set (the centre should not feel too firm). 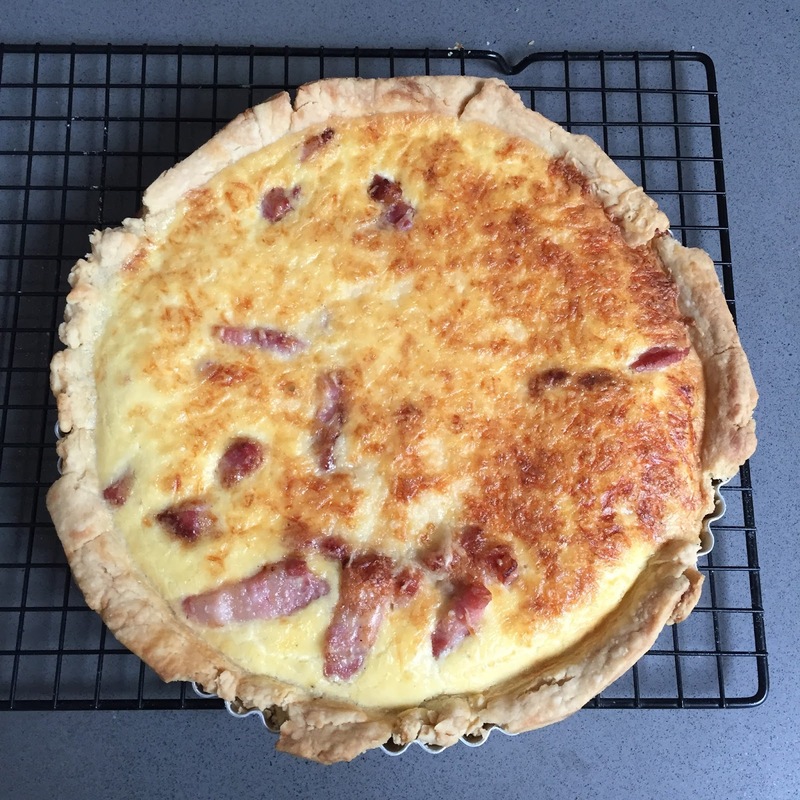 Let the quiche settle for 4-5 mins, then remove from the tin. Serve freshly baked, but it's also good cold. This recipe turned out really well; it tasted really good. I did get some pastry shrinkage, but leaving the excess pastry attached sorted that out. Also, I nearly had a disaster when taking the pastry case out of the oven after blind baking it, it came out of the case, so I had to carefully slot it back in, not easy when wearing oven gloves... but I'll definitely be making this recipe again.